Custom picture frames vs. discount pictures? If you are like most people, when you want to frame your photos, artwork, memorabilia or posters, this question arises. In this article, you will discover why picture frames are not all the same. In fact, discount frames and custom pictures frames both have their specific purposes, customers and consumer markets.If you are in NY or even in places like Scarsdale and White Plains, and are looking for picture, photo or art frames, there seems to be endless stores to buy from or online. In fact, the picture framing industry has been experiencing a boom in the last 5 years. The reason is that almost everyone takes pictures today. There is a camera on your phone, your tablet and computer. In addition, many people email and text pictures back and forth. This has led to more people needing picture frames now more than ever. Have you ever wondered why some picture frames cost $5 and some frames cost thousands of dollars? If you walk the streets of midtown Manhattan or even Astoria, Queens, there are picture frames being sold on street corners and in stores like Walmart, Target and Michaels. While other less known places, have custom frames, like Heritage Frame & Picture Co. have walls full of frames that need to be fitted and assembled costing much more than $5. Could you imagine paying $3,000 for a piece of art and then framing it in a $15 frame? That is the reason many of our art framing customers in Armonk, Chappaqua and Scarsdale call us to custom frame their artwork. Art collectors and those who appreciate art, realize the frame is part of the art and the feeling it invokes. Of course, it is not the price of the frame that makes it a match to the artwork, it is the quality of the frame. Hence, the higher the quality the more the frame costs. If you said no to the above questions, then you already understand why custom made picture, art and photo frames cost more than mass produced discount frames. With most of our picture framing customers in New York, Westchester County as well as throughout the 5 NYC boroughs of Queens, Bronx, Brooklyn, Staten Island and of course, Manhattan, we answer those question all the time. Many of our competitors who sell picture frames in Queens, Manhattan as well as Scarsdale, Chappaqua, White Plains and Pound Ridge - offer cheap low quality picture frames. While we, Heritage Frame & Picture Co. (www.HeritageFrame.com) only sell high quality custom picture and art frames. We have been in the custom framing, art restoration and art installation business for almost 140 years. And we are proud to say that pictures we framed more than 100 years ago, are still sitting in those frames today. Why choose a custom picture frame by Heritage Frame & Picture Co. over mass produced, discounted retail frames? To being with, our custom picture frames are of much higher quality than mass produced frames. Many of our customers- banks, law firms, restaurants, art galleries, museums, corporations and interior designers- want picture frames that enhance the artwork and provide long term durability. In fact, the picture frame is as important as their furnishings, their services and their reputation. All of this represents their brand and their customers experience. Another important point to make when comparing discounted retail frames to custom framing is that it’s possible to depreciate the value and enjoyment of a photo or artwork because of the quality of the materials used to make the frame and the cheap look of the frame. The truth is, custom picture frames by Heritage Frame & Picture Co are better than mass retail picture frames. Before you get concerned, no, Heritage Frame is not going to sell you a picture frame for the cost of a luxury car ( unless you want one created exclusively for you). What Heritage Frame & Picture Co will do is help you customize a high quality picture frame that compliments your art, photo or painting while enhancing its value and appreciation. Custom Picture Frames are a worthwhile investment. In fact, this is a good time of the year to give art, photos and posters as gifts. Framing these make the gift even more special and complete. Heritage Frame has been designing and installing custom frames for almost 140 years. Our custom framing, art restoration and art installation services are backed by a 4th generation company whose experience far exceeds other custom framing companies. Furthermore, we pick and ship everywhere. We also guarantee of work and even make house calls. And we give free custom picture frame, art installation and art restoration quotes and estimates. Yes, our customer service includes meeting you at your home or office, during the day or after hours and weekends. We are that dedicated to you, our customer. Our business has survived almost 140 years because we don’t just sell picture frames, we give high quality customer service with a high quality product. Pictures Frames and art restoration in Irvington NY is available through Heritage Frame & Picture Co.
Heritage Frame & Picture Co (HeritageFrame.com) provides custom picture framing, art restoration and art installation for the Irvington community and businesses. Many of Irvington’s homeowners, restaurants, hotels, art galleries and interior designers rate Heritage Frame & Picture Co as the best picture framing company in Irvington. Being the #1 rated picture frame company in Irvington took years of hard work and experience. In fact, Heritage Frame & Picture Co has been in the custom picture framing business for almost 140 years. They have provided custom picture frames, photo frames, corporate framing and have been hired to hang artwork in Irvington and all over Westchester County and New York City since 1878. Over the years, the picture framing business has changed. Now people take photos with their phones and want those photos framed. In order to improve customer service, HeritageFrame.com now offers Irvington residents and all of it’s customers online, custom digital picture framing. To learn about our new online digital photo framing click here. On that page, titled Online Custom Framing, you will learn how to use our online photo framing service to help you upload pictures and photos from your phone, computer, tablet or ipad and then choose a custom frame. As you know, not all picture frames are equal. If you arrived to this site by searching- “Picture framing in Irvington” or “picture frames near me in Irvington”, thank you for finding us. Our picture frames are of high quality frames and so is our matting. We always look forward to meeting new picture frame customers. If in Tarrytown, please stop by our showroom located at 8 Main Street, Tarrytown, NY.. Once there you can learn about how we customize every picture frame using high quality materials chosen by you, the customer. If you need your photos framed, pictures or posters in a custom frame or need your certificates, diplomas or even posters framed, we can frame it. After we frame your art, we can then hang it in your home, office, place of business or even at an event. We are also one of the few picture framing companies that provide corporate picture framing. And yes, we even frame your art and children's art. You do not have to be picasso, rembrandt or an aspiring artist. Feel free to bring us in your paintings, and we can find a frame that fits perfectly with your imagination. If you have any questions about our online digital custom framing service or need to have your pictures or photos framed, call us at 212-233-3205. You can also email us- Ted@HeritageFrame.com. If you have any questions about our custom framing, feel free to also let us know via our contact form on our website by clicking here. Custom wood picture frames come in a variety of materials, sizes, stains and designs. When we first started designing custom picture frames in New York City almost 140 years ago, wood was the most common material used. Since that time, custom framing has evolved to include aluminum, gold, silver, stone as well as man made materials. 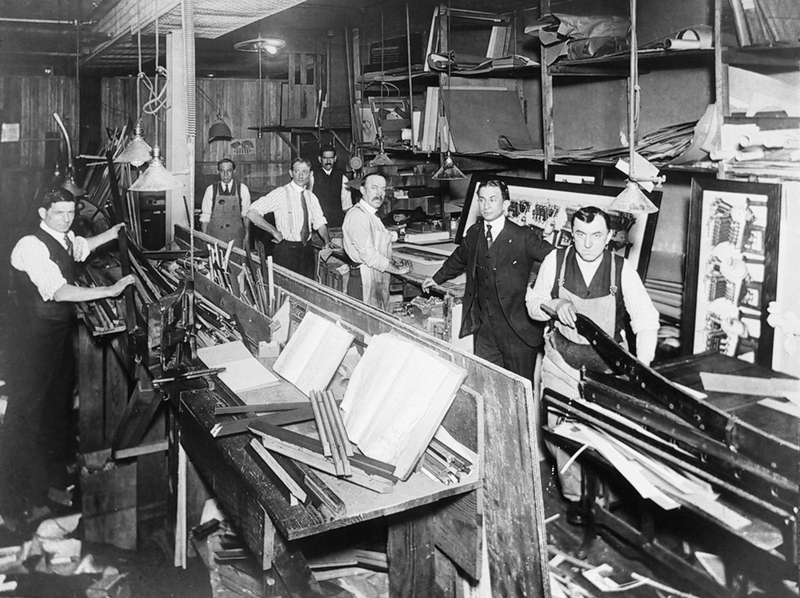 Classic photo of our business in the early 1900's where custom wood picture frames were being designed and assembled. Even with the variety of custom picture framing options, wood frames combined with gold and silver accents is popular among many of our clients in Manhattan, Scarsdale, Chicago, Los Angeles, Miami and Washington DC. When it comes to designing custom wood picture frames, Ted Howell, owner of Heritage Frame & Picture Company is one of the most experienced and active custom picture frame designers in the United States. Ted designed and built his first picture frame when he was 5 years old. while studying as an apprentice under his father who himself was a 3rd generation custom picture frame designer. The experience of working in a family owned business and creating a work of art in the form of a picture frame captured Ted's young mind and attention. Now as the 4th generation owner of Heritage Frame & Picture Co. ,Ted works closely with his clients to make sure they are completely satisfied with their frames and their experience working with the company. Unlike standard discount picture frames, custom wood frames are of much higher grade material and are built to last for generations. In addition, the finish on the frames and matting is carefully selected to enhance the beauty of the frame and compliment the art, photos, certificates, memorabilia, posters or for that matter whatever is framed within. Custom wood frames are made to order. As a result, the frame fits the decor of your room, the period of the art be it 18th century, or 21st century art. A rarely considered bonus of custom wood frames as compared to discount picture frames and mass productions frames, is the time factor. Shopping for discount picture frames at retail outlets and malls can be tedious and unrewarding. Most of the frames are cheaply made. Also, the picture frames do not compliment the room, photo or art work. They simply case the photo in a frame and make it possible to be hung, not admired. Custom wood picture frames designed by Heritage Frame & Picture Co are much more than simple store bought picture frames. To begin with, you are the co-designer of the frame. No, you do not have to put the pieces together. What you put together is the vision of how you want your picture frame to look and feel like. Then you work with one of our custom picture frame designers to confirm the frame compliments both the art or photo being framed. Next, if the location to where the art is being installed is known, then consideration of the decor is included. Just as Ted felt at 5 years old hand crafting his first picture frame, our clients at Heritage Frame & Picture Co feel the same way. And they are a lot older than Ted was then. The reason for this euphoria is that all of us art artists inside. We want to make the world conform to our image and perceptions. When you custom design a picture frame, be it for a family portrait, baby photo, a certificate, poster of your favorite movie or play or you want to frame an object, in many ways you are creating a new piece of art. We have an almost unlimited variety of custom wood frames and materials to choose from. If you want to see samples, please stop by our showroom If you cannot travel or prefer us to come to your location, we will gladly arrange a meeting with you. When shopping for custom wood picture frames, call Heritage Frame & Picture Co first. We guarantee you will be happy with your purchase and will remember the experience for years to come.